To use a really antiquated English phrase, LG is a curious fish in the mobile world. A brand that’s got the worldwide prestige and presence that many rivals would love, yet is struggling badly in the smartphone market. The LG G6 is the phone it needed to make to stop that rot. It’s not alone – HTC, Sony and others are all finding it tough to make a winning smartphone – but LG has been playing a dangerous game in recent years, trying to find an alternative route to smartphone stardom amid a sea of identikit handsets. The thing is, while it was busy zigging in an industry full of zags, it lost sight of what’s important. People don’t buy the iPhone because of the amount of RAM it has or because you can switch out additional accessories; they buy it because it just works properly with the headphones they were given at Christmas and offers minimal hassle when getting on with their daily lives. You can see the problem Android phone manufacturers face: do something that stands out, or spend a scary portion of their yearly budget marketing their handset to force it into the hands of consumers. Samsung had the clout to do the latter, but its recent success came when it rebooted its efforts to stop trying to out-innovate Apple and just make a phone that works. The Samsung Galaxy S5 was a powerful, water-resistant phone with awesome specs… but it looked like a band-aid and felt rubbery and cheap. The Galaxy S6 was almost the opposite. It kept the heritage of Samsung – the great screen, the top-end processor – but sacrificed battery life and headline ‘innovative’ features like being able to wiggle your hand over the screen to shift photos in favor of just making a phone that looks good, takes great pictures and works quickly. And that’s what LG is finally trying to do with the G6. While there’s part of me that loves the idea of a modular phone, that fondness comes with reservations. A phone that splits apart to let me add in a host of new features while offering the security of carrying a second battery to swap in is fun and ‘techy’, but to the outsider who just wants a phone that doesn’t get in the way day-to-day, it wasn’t that appealing, especially as LG panicked and gave up on the modular idea almost instantly. And it seems that LG has finally got the message: the mass-market buyer, the one who doesn’t care if a battery is replaceable, is the bigger catch here. Yes, LG’s now playing in an identical space to Apple and Samsung without the same marketing spend – but it’s not completely without hope. Firstly, the LG G6 is a phone the brand is quietly confident about – that much was clear to me when spending time hearing from its engineers recently in South Korea about the creation of the new handset – and for good reason. The metal and glass design is attractive, the massive, bezel-light display on the front a real head-turner, and the rest of the specs are high-end enough to not disappoint. (The tech fans of the world may miss the Snapdragon 835, as it's the most powerful chipset out there at the moment, but the choice to go for the 821 could pay dividends if LG’s promises are true. Of course, LG has a long way to go before it's talked about in the same breath as Apple, Samsung and others when it comes to the non-tech fan’s phone of choice. It’s unlikely that it’s going to make a camera that’s any better than the rivals (in fact, the sensors on the G6 are remarkably similar to those on the G5) and the design is nice – but not unique enough to make people lust after it. The user interface is fine, but it's certainly not one of the best – the new 'two square' UI, designed to make use of the longer screen, might be seen as too feature-rich to users who aren't interested in multi-tasking or live-previewing photos while snapping. So the main areas where LG can start earning critical plaudits are battery life – and some LG smartphones in the past have lasted an exceptionally long time – and price. In Europe especially LG phones thrive because, while they start at a premium price, they quickly – perhaps within the year – come down to a much more palatable level, sometimes almost half the original cost. It’s far too simple to say that LG finally making a phone without gimmicks is going to turn around falling revenue in its mobile division. 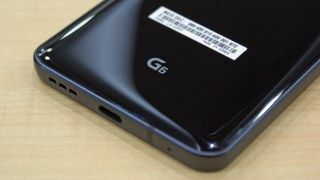 But if the G6 proves to be a well-performing, good-looking phone that lasts for longer than its rivals at a lower price, that's exactly what LG needs to start pulling in more money from its mobile business.